PORT OF SPAIN, June 3. TRINIDAD tonight named four players who toured England with the last West Indies team in the territory's side to play the British amateur soccer team, Middlesex Wanderers in their first match at Queen's Park Oval Sunday. 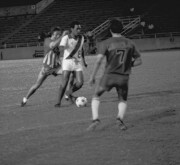 The four are— Captain Pat Gomez, Doyle Griffith, Tony De La Bastide and Alf Corneal, the forward with the powerful shot. Biggest surprise in the team is schoolboy, Jeff Mahon nippy St Mary's centre forward, who recently returned from Barbados with Shamrock team and received a late call to the trials. Notable absentees are Son Baptiste and Stopper Noel Daniel, who went to England with the West Indian team. It is believed Baptiste is injured why he cannot play. The Trinidad team is Gomez, H. Govia, T. De La Bastide, C. Francis, A. Lowe, D. Griffith, R. Hamel Smith, C. Franco, J. Mahon, A. Skerritt and A. Corneal. Reserves are C. Baptiste, Leacock, K. Berassa and Ken Hodge. During the Wanderers' stay — they are due today — Mr. Norman Creek who was sent specially by the English Football Association and Mr. Harold Hobbis, will lecture and hold clinics for the players and schools here. Governor Beetham will meet the players and kick off the first match, while in the final match on Sunday, June 11, Lord Hailes will kick off. Other matches are on June 7 and 9 at Point-a-Pierre.